For any private events please ring Janet Walters on 861153 or email to <walters.n@sky.com> for information on what is required to book the minibus for a private function. Please bear in mind that to use the minibus you will need to obtain a volunteer driver from the Minibus Society's list of approved drivers. 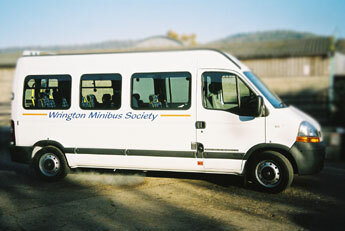 07895 418560  a reminder of the new number to use to book your seat on the Wrington Minibus. This will enable the committee to share in the administration of the diary without the need to put messages on answerphones to redirect callers to another number. Messages can be left on the new number and the diary administrator will get back to you as quickly as possible. In order to continue offering the range of trips, that we currently do, to Wrington residents we urgently need to recruit some more drivers. Can you spare a few hours once or twice a month? Do you have D1 class on your driving licence? If so, please call Adrian Hopkins on 01934 863857 or email <adrianjhopkins@btinternet.com> to find out more. We can’t run this village asset without your help! Just one of several innovations to village life began in 1975. Many of us will remember Cerise Lawson-Tancred (the then rector's wife) and her enthusiasm in getting a Minibus for Wrington. An open meeting, held on 15 May 1975, under the chairmanship of David Sladen, resulted in an interest free loan of £1,000 from an anonymous donor, plus £1,074 from various fund raising occasions. The loan was repaid in June 1977. In July 1975 a second-hand Bedford Dormobile Bus was purchased from Richard's Garage for £901.80p. Replacement of this bus was in February 1981 - £4,971 for a new vehicle. This was followed in August 1986 with £8,184 being spent on a new Ford. The present vehicle was purchased in July 1991 for £12,000. Our projected replacement vehicle will cost in the region of £30,000 (a model which will be helpful for disabled travellers). Towards this we are at present applying for a grant. It will be the first time we have ever had a grant from any source. All our expenses have been met by local donations, fund raising, Friends of the Society and contributions from travellers on the bus. The Society was registered with the Charity Commissioners in April 1977. The Trust Deed was drawn up by the local solicitors, the trustees being David Sladen, Tony Kennett, Alison Robbie and Joyce Smith. At first the bus was only to be used by members who paid an annual sum of 20p, the elderly, disabled people and children. Membership was limited to residents, permanent or temporary, in the civil parishes of Wrington, Redhill, Butcombe and Burrington. After several years the bus is now used mainly by Wrington and Redhill residents and can be used by any residents of the parish. In 1975 it was agreed that, whilst all donations were acceptable, a reasonable basis would be for these journeys: Weston 30p, Clevedon and Winscombe 20p and short trips 5-10p. Today the fare to Weston is £1.50. The present schedule includes local trips to the URC each Sunday. Friendship Club to the Memorial Hall, National Trust Groups to Weston, Redhill OAPs to Felton Club, The Luncheon Club weekly to the Scout Hall, plus other longer journeys - e.g. 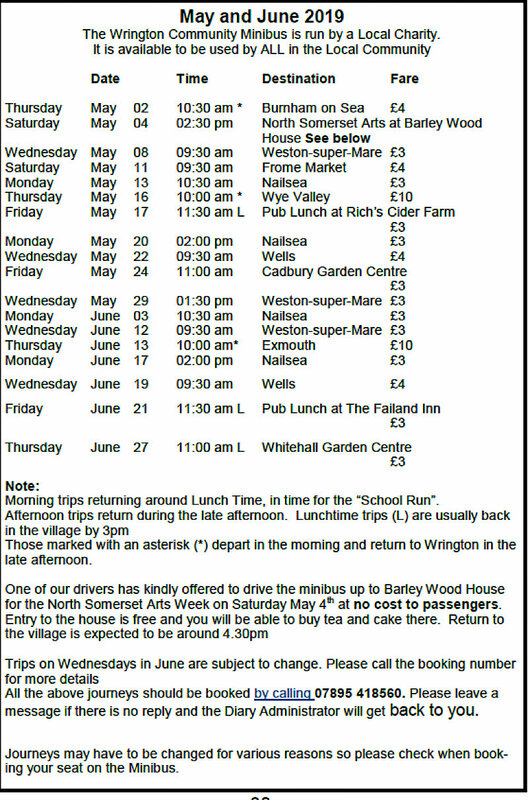 Stourhead, Minehead, Slimbridge and Mystery Tours and recently taking youngsters to Alton Towers. None of these journeys would be possible if we did not have voluntary helpers: a band of drivers organised by Barbara Coats for each month ahead with help from Leonard Humphry to draw up the schedules, booking agents - the drivers need to know who the passengers are - and someone to check the bus each week at the garage. We are proud of the combined achievements over the past 25 years and hope that - whether or not you use the bus - you will support any appeal for our funds. I am very grateful to Joyce Smith for providing me with some of the early minutes of the Society.